Youth join gangs for a variety of reasons such as the excitement of gang activity, peer pressure, status, attention, protection, family benefit, family tradition and lack of realization about the hazards involved. In many cases, young people are not discouraged from gang involvement by their parents. Often, parents do not realize their children are engaged in gang activity. San Bernardino has reportedly the third largest gang population in the United States. As chair of the San Bernardino Countywide Gangs and Drugs Taskforce, my duty is to identify and promote resources in the community to divert our community’s youth from involvement in gangs and drugs. We can do this together. San Bernardino County Gangs & Drugs Task Force is committed to a strong leadership role in coordination, collaboration and communication between law enforcement, the criminal justice system, Social Services, education, probation, mental health, children and family services, elected officials, the community at large and private enterprise. The Gangs and Drugs Taskforce provides information and resources in an effort to prevent and stop the alarming trends that poison our neighborhoods and cripple our communities. The world in which we live is filled with many hurdles that families must navigate. Many of our youth and their families have encountered situations in which they have been traumatized and need a tremendous amount of support, whether that be physically, mentally or emotionally. We, as a society/community, must provide hope for families. Moving forward we All must come together as a society at large and Nation to assist all families in alleviating the climate of despair perpetuated by gangs and drugs in our communities. We must expect that together we can make a substantial impact in the lives of youth and their families. We will make a difference! 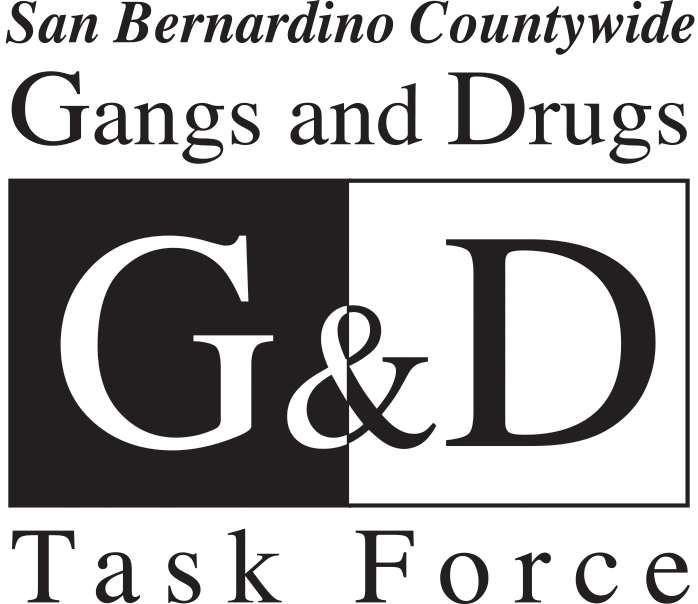 The San Bernardino Countywide Gangs and Drugs Task Force is committed to a leadership role in advocating the prevention and suppression of gang membership and drug use throughout San Bernardino County through coordination, collaboration, and communication between education, law enforcement, the criminal justice system, elected officials, private enterprise, and community at-large.